MUMBAI: Scores of activists and victims of mercury exposure from the now-closed thermometer plant of Hindustan Lever Limited at Kodaikanal demonstrated on Friday at the annual general meeting of the company here. 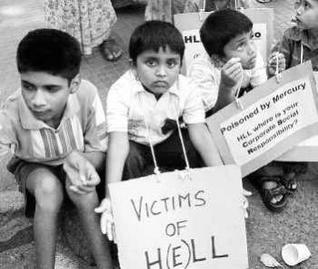 HEAR US OUT: Children from Kodaikanal suffering from mercury-related illnesses protesting in Mumbai on Friday against HLL for dumping several tonnes of mercury-contaminated wastes from its thermometer plant in Kodaikanal. They demanded that Hindustan Lever clean up all the mercury from Kodaikanal’s environment, compensate workers who were exposed to it in the factory and also their families who were contaminated by the mercury carried home from work. The activists belonging to a Chennai-based NGO, Community Environmental Monitoring also wanted Hindustan Lever to provide long term medical monitoring and health remediation for all the workers and exposed residents. The issue was raised at the meeting by Davar, a shareholder, who wanted to know how the contamination and pollution could happen at a plant that belonged to such a reputed company. The Chairman of the Company H. Manwani told shareholders that the company was awaiting consent of the Tamil Nadu Pollution Control Board for remediation of the land contaminated with mercury but he denied that the people were affected in anyway by the toxic element. Mr. Manwani said, “everybody was given medical test and even observation tests were also carried out.” He said that no compensation was paid. Mr. Manwani said that the company had sent all the toxic material weighing 291 tonnes to the United States for disposal in May 2003 and the National Environment Engineering Research Institute (NEERI) was called to assess the situation. The activists displayed placards showing pictures of the victims including children suffering from birth defects. Shweta Narayan told The Hindu that some persons tried to stop her from distributing cards and pamphlets to wives of board members of Hindustan Lever coming to the meeting. The company had set up a thermometer making plant, imported from the U.S., at Kodaikanal in 1983 but had paid no attention to rules and regulations in handling extremely toxic substances, she said.